One of the biggest mistakes that people make when moving, be it home or office, is that they don’t make the necessary arrangements until the very last minute. Naturally, this can lead to stressful situations and can make even a straightforward move an unpleasant one if you don’t have the right help. It’s for this reason that we recommend all of our visitors who have been searching for a removal company/business in London to finalise their moving and storage arrangements sooner rather than later. At Best Van & Man we have well over 10,000 successful jobs under our belt so you can depend on us to get the job done quickly, efficiently and professionally. Placing your trust in a company in the concentrated removals industry can be difficult, especially if you are looking to move expensive or sensitive equipment. 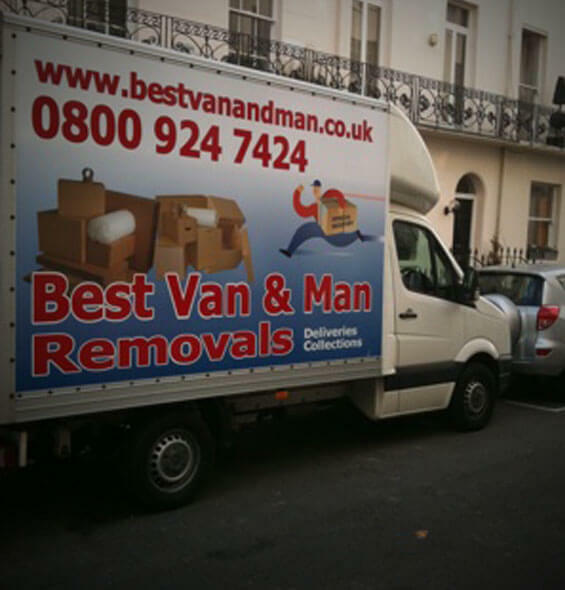 Here at Best Van & Man Removals, we have the valued reputation, vast experience, attention to detail and wide range of vehicles that you can count on. One chat with our professional team will be all that is needed to place your mind at rest. Covering all areas of London (North, South, East, West and Central), we are experienced in moving all manner of items, from complete house moves to valuable antiques and sound, stage and lighting equipment. Get in touch with us now. Some removal companies will provide a service that starts and finishes with loading up their van and transporting items from point A to B. At Best Van & Man, our professional team will help you organise your move from start to finish. We believe in going the extra mile – above and beyond what is expected of us, to deliver a flawless service. Attention to detail is one of our best known features. When you choose us as your removal service provider, you won’t have to worry about mistakes or poor planning. We have an elite system in place to ensure that your move is completed without a hitch. Discover more about the professional assistance of recognised experts today with Best Van & Man; delivering you and your cargo in pristine condition across London and further afield. © Copyright 2008-2018. Best Van & Man Ltd All rights reserved.